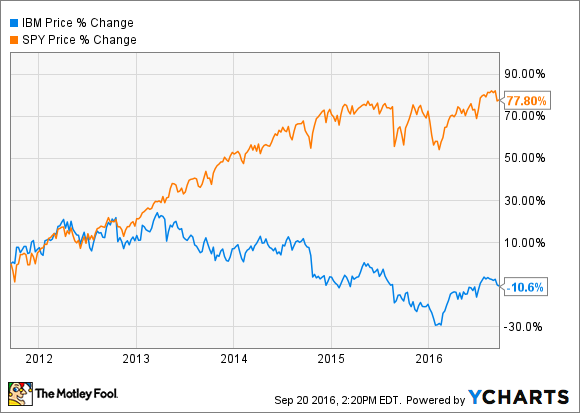 Will IBM Sink or Swim? The IT giant needs to show tangible progress in order to win back investors. Even though shares of International Business Machines (NYSE:IBM) are up about 12.5% year to date, trouncing the broader market, the past five years have been painful for investors. IBM stock has tumbled about 10% in that time, compared to a 77% gain for the S&P 500. Dividends have helped to soften the blow, but calling IBM's performance disappointing would be an understatement. IBM is facing the challenge of transforming into a company that can thrive in the age of cloud computing. Revenue and profits have been tumbling, driven by declines in legacy businesses, and investors are right to question whether IBM's long-term strategy is sound. Can IBM turn things around and return to growth? Or will a rapidly changing technological landscape render the company obsolete? IBM's revenue has declined on a year-over-year basis for 17 straight quarters. The declines have been small, adjusting for currency and divestitures, but shrinking revenue is never a good thing. There are parts of IBM's business that are growing rapidly, namely the company's various strategic imperatives, but the ongoing decline of legacy businesses is dragging down sales. Profits are in decline as well. IBM expects to produce at least $13.50 in adjusted earnings per share this year, down from $14.92 in 2015 and $16.53 in 2014. Declining sales in legacy businesses and investments being made in growth areas like cloud computing are responsible for the deterioration in IBM's profitability. It's not all doom and gloom, though. IBM's strategic imperatives now account for 38% of total revenue, and while growth has slowed down, the collection of businesses still grew revenue by 12% year over year during the second quarter. Total cloud revenue soared 30%, while cloud-delivered-as-a-service annual run rate jumped 50% to $6.7 billion. IBM offers infrastructure-as-a-service (IaaS) through SoftLayer and platform-as-a-service (PaaS) through Bluemix, and much of its software is now offered as a service as well. Unfortunately, this growth hasn't been enough to counteract weakness in other parts of the business. IBM is a lumbering giant, spanning hardware, software, and services, making the process of transitioning its business a slow and painstaking one. The good news for investors is that the overall strategy makes sense. IBM's cloud strategy is very different from that of Amazon Web Services, the leading provider of infrastructure-as-a-service. While Amazon aims to be the lowest-cost provider, IBM has no interest in competing in markets where price is the only meaningful differentiating factor. Instead, IBM is focused on delivering high-value products and services to its enterprise customers. Watson is the most high-profile cloud service offered by IBM. The company doesn't break out revenue generated by the cognitive computing system, most likely because it's not yet very impressive. But IBM expects Watson to become a major business in the long run. The system is being used in a wide variety of industries, most notably healthcare, and it's available in the form of various services on the IBM's cloud platforms. For IBM, the goal is not to simply build the biggest cloud. The company's IaaS and PaaS platforms enable the high-value services that will differentiate IBM from other cloud computing vendors. In the short term, IBM's results will almost certainly continue to be lumpy and disappointing. But these types of transformations are never quick and easy. As an IBM shareholder, I believe that the company is on the right path. This doesn't guarantee that the company will be successful, though. IBM has a large base of enterprise clients in a wide variety of industries that are dependent on the company's products and services. Switching costs are meaningful, but as those clients transition to the cloud, IBM needs to ensure that its cloud is appealing. Otherwise, it could start bleeding enterprise clients, which would erode its competitive advantage. IBM needs to return to growth sooner rather than later for the market to give it credit for its transformation. If revenue and earnings declines drag on, the stock could drop as investors become more pessimistic. On the other hand, if this year turns out to be the bottom, with earnings growth returning in 2017, the pessimism driving down the stock could disappear.